The only thing we have more fun with than dogs is grand kids. Well most of the time it's fun, you have your days with kids like you have some days here and there with the dogs. Actually now that I think about it, teaching kids and training dogs is not that different. Here we are enjoying a day at the beach with all 6 of them. Another is on its way, we need another boy, Kristian is getting out numbered 5 to 1 right now. That's me holding the newest Genevieve, Delany, Makinly, my wife Genny, holding Josie, then Kristian, and Morgan. Here's what makes a gun dog, BIRDS. 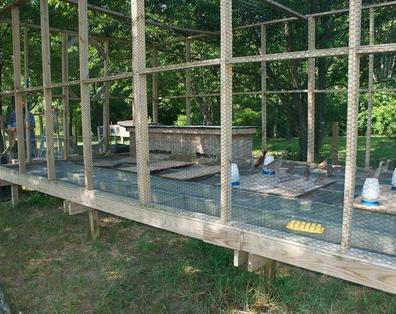 Here's our flight pen with a collection of Georgia Bob Whites, Chukars, and a few Ring Necks. 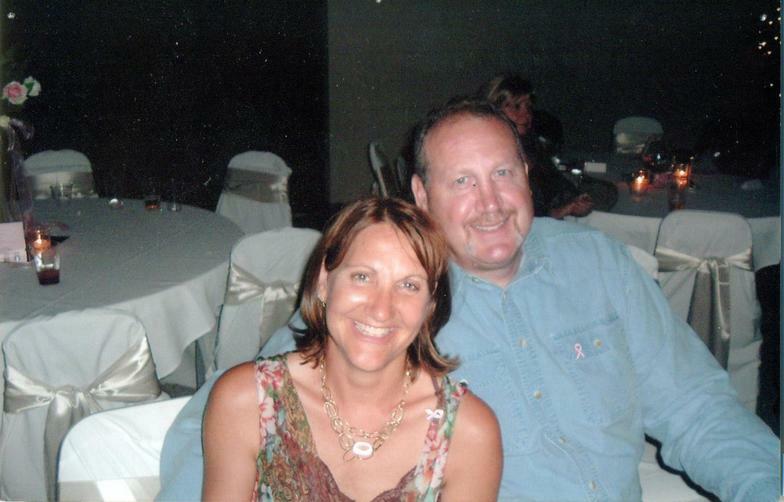 GRAND RIVER GUN DOGS is owned and operated by Steve & Jenny Scharrer and is located in Howell, Michigan. I'm Steve and I have just recently expanded my family kennel into a formal Gun Dog breeding kennel. We only own and breed German Shorthair Pointers. I am an avid bird hunter with my favorite bird being the classic Ringneck Pheasant. My love and passion for gun dogs and Pheasant hunting began when I was just 8 years old. The year was 1960 and my family had just moved to Michigan after living for 3 years in Germany where my dad was serving in the US Air Force. We lived near Davison, Michigan close to a small farm my grandfather lived on. That first fall I heard all the talk about Pheasant hunting, as well as seeing the birds on a daily basis raiding our garden. After begging begging for what seemed like forever, my parents agreed to let me stay home from school opening day and go on my first pheasant hunting trip. Opening day was rainy as was typical of opening mornings. We went to my grandfathers farm to hunt and our group was made up of myself, dad, granddad, and his English Setter, named Putt, (like what the golfer's do). I didn't have a clue what to expect. I can still see Putt pointing the first bird as we gathered around, me in the back, and dad and grandad going in to flush the bird. The thing that amazed me and stuck in my mind was how Putt could find those birds like he did, then point them out to us as well. When that Rooster flushed into the air, the hook was set, and I was hooked for life. The following fall Putt, who happened to be a female, had a litter of pups and me and my brother was allowed to pick and keep one. We named him Blacky. He was my first bird dog and I have had quit a few over the years since Blacky. I've had English Setters, a Springer Spaniel, a Brittany, a few Irish Setters, a English Pointer, and finally I tried a new breed a friend told me about, the German Shorthair Pointer. That was a little over 20 years ago now. Dottie was my first Shorthiar and she was great. I've never had the urge to try another breed since then and now I'm a Shorthair man for life. A few years ago, I decided that I'd like to start breeding and Grand River Gun Dogs was born. We are fortunate to have several very nice and talented bird dogs and I have became a student of breeding and reviewed and studied pedigree's of many of today's finest gun dogs. The family and bloodline of the dog I settled on was a dog named DC HIllhaven's Hustler. The DC stands for Dual Champion, conformation and field. Everyone wants a talented hunting dog, but everyone also likes a dog that hunts with style and has a flashy point. Hustler was a great performer in his own right, and produced many talented off spring as well. He was the second all time leader of sire's of Dual Champions, 5 in all. He also sired 22 show champions, and nine field champions. Many of those talented offspring have gone on to produce many outstanding dogs and the Hustler line continues to produce gun dogs that compete at a high level. One of those line bred Hustler dogs is DC AFC 3 x NSTRA CH Gamble's Odyssey Fritz MH Ut2. A son of Fritz, named Fieldmaster's Siver Dollar MH, was bred to our foundation female, Scharrer's Coco, to produce our stud Dog, Scharrer's Buddy. These two dogs, along with a few other young Fritz & Hustler line bred females are the beginning of GRAND RIVER GUN DOGS. Here we are at the beach this past 4th of July sitting with our proudest litter, the grand kids. Here we are at our 35 year class reunion. Pistol Pete is a son of Scharrer's Coco, so you have all of the great dogs in her pedigree also in Pete's. Pete is a young dog, but he has been one of the easiest dogs I've had to train. He is very smart and solves problems quickly. He likes to please and does everything with great enthusiasm and eagerness. He hunts hard, has a super nose, and a stylish point. Pete's sire, DC Fieldmaster's Maximum Point, call name Stich, is sired by Champion Virginia's Upland Gentleman. Upland Gentleman also produced NSTRA Champion Fieldmaster's Nothing But Trouble, who sired 2 x NSTRA CH. DC Fieldmaster's Deark Night of Trouble. Bonnie is line bred off of 3 x NSTRA CH. DC AFC Gamble's Odyssey Fritz MH. Bonnie's sire is my stud dog Scharrer's Buddy NA 1. Bonnie's dam is my female Gamble's Tasmainian Devil. Taz's dam is Gamble's Jumping Jackie MH, another daughter of Fritz. Her sire is FC AFC Palm Glades Jameson SH. Jameson is son of FC AFC Palm Glades Shameless Lenny and grandson of the great NFC L B's Ohi Shameless. Bonnie has great conformation, great athleticism, super nose, and rock solid point. I think this breeding will produce the same type of dogs that show up in Pete's and Bonnie's pedigree. Both Sach and LC are great Gun Dogs. Each have great natural ability and are very intelligent. They are easy to train and handle as well. Sach is a son of Fieldmaster's Silverdollar MH and a Grandson of the great 3 x NSTRA Champion DC AFC Gamble's Odyssey Fritz MH UT2 . Sach's dam, Shooting Starr's Picky Desire is a Grand son and Grand daughter of Shooting Starr's Kennel founding Sire & Dam, VC Shooting Starr's Son of a Gun MH and Shooting Starr's Hail Storm UT1 MH. Son of a Gun and Shooting Starr Kennels has been one of the most accomplished lines being run in the NAVHDA hunt test trials. LC is a daughter of Grand River Gun Dogs founding dam, Scharrer's Coco. Coco's sire, Mutigerhund's Firewalker MH was sired by the great CH. Stradivarious Maximillien out of Stradivarious Symphonie, a daughter of DC AFC Stradivarious Baroque, one of the 5 Duel Champions sired by the famous Duel Champion Hillhaven's Hustler. Coco's dam, Pinecreek's Lapping Traffic was sired by Pinecreek's Trip to Hillhaven, who's sire was another of DC Hillhaven's Hustler son's, DC AFC Cebourn's Erick of Hustleberg. Coco's dam, Pinecreek's Lapping Traffic, was out of CH. Pine Creek Custom Collection, who was out of DC Hillhaven's Hustler and Champion Maggie May Warner. This is the most recent and concentrated Hustler breeding you will find. LC's sire is 2 x NSTRA Champion, DC Fieldmaster's Dark Knight of Trouble (Dutch). Dutch is a son of NSTRA CH Fielmaster's Nothing But Trouble, and grand son of Ch Virginia's Upland Gentleman. Dutch's dam is Saddleup Hustler Von Boomer, a daughter of Mutigerhund's Trinity Vom Max, who is a litter mate to Coco's sire Mutigerhund's Firewalker MH. Saddle Up when bred to 3 x NSTRA CH DC AFC Gamble's Odyssey Fritz MH UT2, produced Sach's sire, Fieldmaster's Sillver Dollar MH. Through Sach and LC's , you will find some of the most accomplished off spring of Hustler available anywhere. This is the breeding I've been waiting to put together for a long time and one that I believe will produce dogs that will be able to compete at the highest level in the hunting field, at field trials, in hunt test, or the show ring. new stud dogs into our breeding program, Fieldmaster's All I can Say is Wow (Nick) , being bred to Scharrer's LC, and DC Kan-Point's Summer in the City.